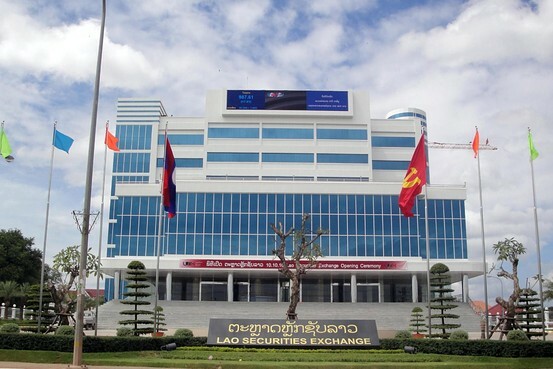 The Lao stock market is to begin online trading in August. The Lao Securities Exchange (LSX) expects to allow people to purchase and sell stocks over the internet in August, after being unable to offer online trading in the first quarter of this year. “The online service will take effect in August. We are ready to offer this service now but we have to wait for some legal documents,” LSX Chairman and CEO Assoc. Prof. Dethphouvang Moularat said yesterday. He added that the online trading regulations must be ready before the market can offer the home trading system. The LSX signed an agreement with Korea Telecom last month to purchase, install and maintain IT equipment as part of its infrastructure preparation for online trading. Under the agreement, the Korean telco will also train stock market staff so they can use the equipment to boost the efficiency of stock trading in Laos. The Lao Securities Exchange signed an MOU with Lao Telecom earlier this year to provide the stock market with a high speed and secure internet signal, one of the main requirements to enable the market to offer smooth online trading services. Assoc. Prof. Dethphouvang spoke to Vientiane Times yesterday while attending a seminar in Vientiane on understanding capital markets and accounting. The seminar was made possible due to cooperation between the Lao Securities Exchange and the Stock Exchange of Thailand. Officials from companies, enterprises and financial institutions that plan to list on the stock market were in attendance, taking the opportunity to learn more about the stock market, listing requirements and the procedures they must undertake. Seminar participants also learnt about the standardised accounting system which companies must install before they can list. Companies’ accounting, financial and management systems must be transparent before they can be listed on the market. The Lao Securities Exchange currently has two listed companies, EDL-Gen and BCEL bank. It plans to list more companies by the end of this year. However, a lack of knowledge about the stock market among the Lao public and enterprises has made it difficult for companies to sell their shares. Most active investors who trade on the stock market are foreigners despite the fact that market authorities impose a number of restrictions. Foreigners are allowed to purchase only 10 percent of a listed company’s shares and one foreign investor can hold only one percent. The market currently has around 8,000 accounts of which only 50 percent are owned by Lao nationals. Last year, the average daily trading volume was only about 150,000 shares, much lower than predicted. The Lao Securities Exchange has worked with other sectors to hold seminars and training workshops in recent months, hoping to inform people about the new investment opportunities in the Lao stock market.